What type of Air Pistol do you use? 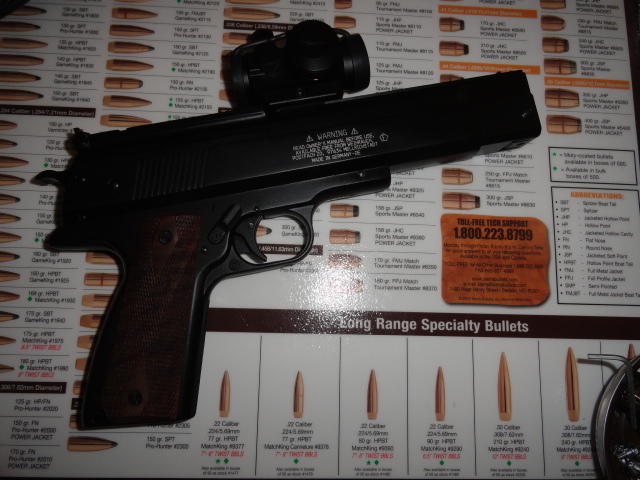 I am considering the purchase of an Air Pistol to hone my trigger control over the winter. What kind do you use and what do you like about it? Re: What type of Air Pistol do you use? I have a FAS 6004. This is the new version of the FAS 604 made by Chiappa Firearms. I bought the model with the ambidextrous grips. It has an upper cocking lever which is not too hard to operate. The trigger (two stage) has several adjustments although I found it acceptable as it came. The sights work well for my 62 year old eyes, although some might want a tighter "fit" in the notch. Adjustments are well marked. It is not the least expensive option, but I feel it offers good features and workmanship for the money spent. I purchased mine through Airguns of Arizona. It was not in stock when I first called about it, but I put my name of their "list." A phone call several months later resulted in an efficient purchase and quick delivery. A Styer LP50 was recommended to me because it has 5-shot magazines which allow practice of sustained fire strings. There is also a trigger option that would allow a ~3lb trigger pull rather than the typical ~1lb. This is a serious competition air pistol and is therefore seriously expensive. There are less expensive ways to improve trigger skills. If you are bored with dry-fire, you might want to look into SCATT. I tried the demo at Camp Perry and it was cool being able to see how your trigger pull influenced the sights before, during and after the break. It's also expensive. I haven't spent my own money on either so you might want to get input from owners/users before going with either. Dryfire with your own pistol is probably the best for trigger control. I do shoot a used Steyr LP10 and it helps with follow through. But I'm not sure that the 500 gram trigger really helps to master the 3.5 lb 1911 trigger. When dry fire drills get boring, switch to the dotter drills. I shoot a Steyr LP1p which is the predecessor to the LP10. In my opinion shooting a pistol with a 17.6 ounce trigger will help with sight alignment and trigger control especially for the long line. Was sitting in expert class for a long time, then stopped shooting bullseye for about three months only focusing on air pistol. Returned to bullseye and my scores went up to get my master card. Coinsidence; honestly do not think so. Get the proper grip size, I use an X-large and the LP allows excellent grip adjustability. It is only used for 10 meters on the proper target with the accuracy needed to hit the center of the 10 ring. If you did not hit the center it is not the guns fault, I did something wrong. I like the fact of being able to trust your equipment with a little higher end air pistol. Besides I can shoot it in my garage that I have set up for 10 meter shooting all year long. I have been using a Daisy 777 that I put an old red dot on. Pistol is crazy accurate. Spent $50 on the pistol and another $30 to buy new seals. Chip, unless you bought that 777 a loooonnnngggg time ago you got one hell of a deal. good on you. everyone discounts the Daisy but for non match shooting I say they can teach a lot about hold, follow through and trigger control. I have my new shooter using one now, he actually likes it and once he holds the black for five shots for a few targets I will switch him over to an LP5 for timed and rapid type drills. I say shooting .177 air pistol is mandatory if you intend to shoot a 9mm, I find the follow through needed to be the same for those two calibers. LP50 with 1911 grip and 4lb trigger option (not cheap) I bought it for timed and rapid fire drills. That is the one advantage of the LP50. robert84010 wrote: Chip, unless you bought that 777 a loooonnnngggg time ago you got one hell of a deal. good on you. everyone discounts the Daisy but for non match shooting I say they can teach a lot about hold, follow through and trigger control. Nope, just this past year. It was well used and nothing to look at, but it has a suburb trigger and is incredibly accurate after I replaced the valve and o-rings. Cost $50 used and holds the X-ring at 50 yards. Good enough for dry fire with feedback. Speaking of which I need to get my backing set up in the new house! For indoor slow fire practice I have a Weihrauch HW45 - AKA Beeman P-1 with a cheap Chinese Aimpoint micro knockoff for a dot scope. It approximates the feel of a 1911, has an adjustable trigger, and two different velocity settings. Finding the correct scope rings to fit the 12mm dovetail is difficult but otherwise it's a fine pistol. I have a couple of Feinwerkbau model 65's and a Morini 162EI short. The FWB's are for lending out to people who want to try air pistol matches. The Morini is what I use in matches. The FWB's are extremely accurate; the trigger can be adjusted with the throwing of a switch for a heavier trigger and the pistols can also be set up to simulate recoil. You can find them for sale for $450-$650 or so. I think you are on the right track if you want to improve your slow fire scores. An air pistol can be another tool in your training box. I moved through a Daisy 777 to practice for conventional pistol to an IZH-46 because air pistol was fun, inexpensive and available and finally to a Steyr LP1P because I plateaued four points short of master (the Steyr bought me six points and a master card). Eventually I shot exclusively air pistol for many years since it was much less demanding of my time. I quit and returned to conventional pistol only because I had vision issues that couldn't be resolved. Air pistol is a great event; precision shooting with a range as close as your basement, backyard or living room. I'd suggest the IZH-46 or IZH-46M (higher velocity) if you want to practice. The 777's are good for the money, but you really need a better pistol for serious practice or competition. Get a pre-charged "scuba" gun if you get serious about air pistol and are shooting in the upper half of the expert classification or better. Pic of my air pistol. Steyr LP1p that I purchased from Pilkington quite a few years ago. I shoot this in my 10 meter setup in my garage. Have not shot in any PTO's since the move from Phoenix. Wish there was a place close but it is what it is. I've got the IZH46. It's very accurate. I made a set of Beretta-like grips for it that I used for a few years. I bought an aftermarket trigger. I think I'll try to make one myself. At some point, I'll get a PCP.